As part of its recently unveiled industrial strategy, the UK will invest an additional £7 billion ($9.3 billion) in R&D spending over the next five years as a step in a longer-term plan to nearly double the nation’s investment in R&D as a fraction of its GDP. Increasing R&D investment is a central component of the strategy. The government aims to raise the rate of spending on R&D from 1.7 percent of GDP to 2.4 percent by 2027. It also articulates a longer-term goal of reaching a 3 percent figure, on par with the Europe 2020 strategy target for R&D. As a step toward meeting this goal, the government will invest an additional £7 billion ($9.3 billion) in R&D funding spread out over the next five years, which it calls “the biggest ever increase in public funding of R&D.” As a result, the strategy says total annual public investment in R&D will increase from £9.5 billion ($12.7 billion) to £12.5 billion ($16.7 billion) by 2022. The strategy’s release comes as the UK is preparing to leave the European Union in 2019. While the government emphasizes it wants to maintain its research and innovation partnerships with its EU counterparts, it is unclear exactly what form future collaborations will take. The UK’s total R&D spending level as a fraction of GDP lagged behind the EU’s 2 percent average in 2015, as well as the U.S.’ 2.8 percent and Germany’s 2.9 percent that same year. 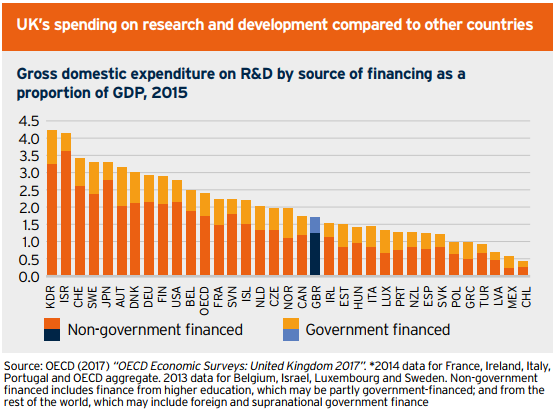 Data from a recent Organization for Economic Cooperation and Development (OECD) report included in the strategy shows that the UK spends less on R&D as a fraction of its GDP than many of its competitors, including the U.S., Germany, and France. The strategy emphasizes the importance of government-funded initiatives, saying “governments can make long-term investment[s] that no single commercial or academic player can take alone.” Currently, most R&D investment in the UK comes from non-government sources. According to the Organization for Economic Cooperation and Development (OECD), business sources made up 48 percent of UK R&D investment in 2015. Only 28 percent of R&D was financed by the government. The government expects that increased public R&D funding will encourage more private R&D spending, noting that “R&D is an example of public spending stimulating rather than displacing private spending.” It asserts that “every £1 of public investment on R&D attracts around £1.40 of private investment.” The government estimates its actions could lead to public and private R&D investment increasing by £80 billion ($107 billion) over the next decade. To catalyze investment, the government will work with the private sector to develop a new “roadmap” to “drive business investment in R&D and focus on key sectors, technologies, and clusters” as well as consider improvements to financial access, regulatory frameworks, and intellectual property. The government also plans to increase the R&D tax credit, which allows companies to reimburse costs on certain S&T projects, from 11 to 12 percent starting in 2018. The strategy identifies four transdisciplinary societal “grand challenges” that will guide future funding decisions: (1) leading in artificial intelligence, (2) capitalizing on the global shift to clean growth, (3) shaping the future of mobility, and (4) meeting the needs of an aging society. To accelerate research addressing these four challenges, the government will invest an additional £725 million ($970 million) into the £1 billion ($1.34 billion) Industrial Strategy Challenge Fund. The fund was established earlier this year with an initial focus on accelerating research and innovation in areas like robotics and artificial intelligence, manufacturing, and space technology. The additional funds will support a new wave of programs that address the challenges in areas such as energy systems, transforming construction technologies, and data for early diagnosis and precision medicine. In addition, the strategy lays out plans for a set of “sector deals” that will partner government and industry stakeholders in key sectors related to the four challenges. The first partnerships will be in the life sciences, construction, artificial intelligence, and automotive sectors. The strategy also articulates the UK’s aspiration to strengthen and expand international R&D collaborations, starting with the launch of a new International Research and Innovation Strategy next year. The government will also establish a £110 million ($148 million) International Collaborations fund that will support global engagement. The government has already begun to develop new arrangements. For example, the UK signed its first umbrella S&T agreement with the U.S. earlier this year. As the first major collaboration supported under the agreement, the UK has pledged $88 million for construction of the Long-Baseline Neutrino Facility/Deep Underground Neutrino Experiment. The strategy also highlights the development of a joint Science, Technology, and Innovation Strategy with China, as well as ongoing support for initiatives with India. Meanwhile, the UK is one of the largest recipients of Horizon 2020 (H2020) funding, the EU’s current flagship research funding mechanism. While the strategy notes that the UK wants to continue to participate in EU research funding programs, it is unclear how future participation will continue. The UK has signaled its desire to seek a far-reaching science and innovation agreement with the EU that establishes a framework for future cooperation. We would welcome the chance to discuss possible options for our future involvement in the EU framework programmes as part of this agreement. The UK wants to continue to take part in those specific policies and programmes which are greatly to the UK and the EU’s joint advantage, such as those that promote science, education and culture. The UK and EU reached an agreement on Dec. 8 that the country will continue to participate in H2020 through its completion in 2020. However, discussions continue as to how the UK will participate in future EU research framework programs.